Southern Province Governor Keerthi Tennakoon with forest officers in the Kottawa Forest Reserve in Galle. Picture by Mahinda P.Liyanage- Galle Central Special Corr. 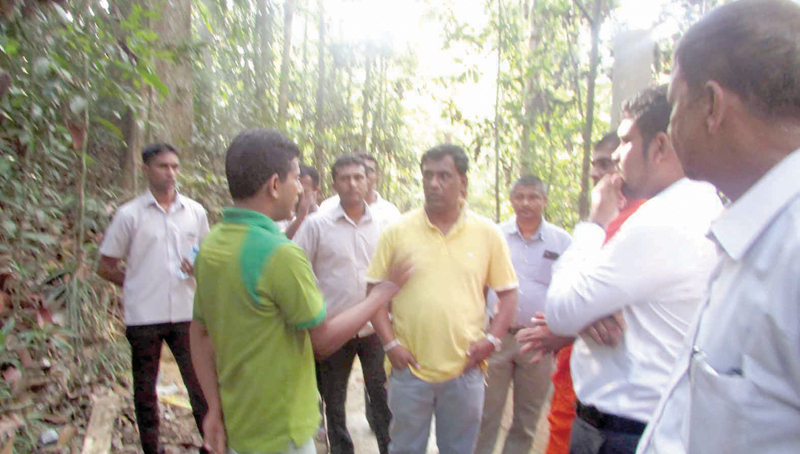 Essential infrastructure facilities and the support of law enforcement agencies would be given to forest rangers to control the widespread felling of wallapatta trees in the Kottawa Forest Reserve in Galle, Southern Province Governor Keerthi Tennakoon said. He gave this assurance during an inspection tour of the Kottawa Forest Reserve on Saturday. During the inspection, the Governor was made to understand that the wallapatta (agar wood) racket was carried out by illegal encroachers with the patronage of influential personalities of the area. He also learnt that forest officers have minimum infrastructure facilities to deal with this problem. “Forest officers alone cannot combat the wallapatta racket. They should be supported by the other agencies such as the police, the Police Special Task Force and the respective Pradeshiya Sabha,” he said. He commended the Yakkalamulla Police and Pradeshiya Sabha for the cooperation rendered to the forest officers’ effort to control the illegal wallapatta business. “The Kottawa Forest Reserve is located close to the World Heritage City in Galle. We will take every possible measure to end this problem through the Southern Provincial Council. The encroachers not only cut the wallapatta tree, they destroy other valuable trees in the reserve,” the Governor said.